Exhibited:	The Royal Academy, 1875, no.345; The Royal Academy, Winter Exhibition, 1897, no. 147 (label attached). 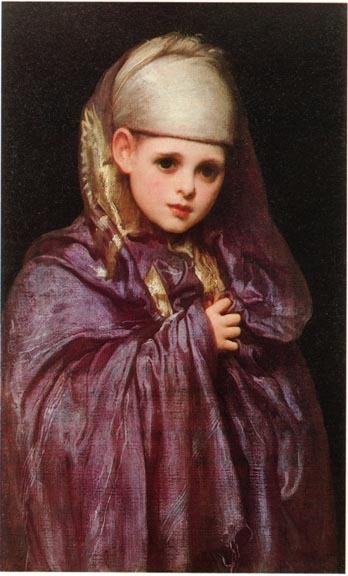 As Ruskin noticed in his Academy review Fatima appeared twice amongst Leighton's exhibited paintings in 1875. She was also the model who stands in the foreground of his Portion of the Grand Mosque of Damascus (Ormond no. 216, plate 138) now in the Harris Museum and Art Gallery, Preston. It may be assumed that both paintings were done during Leighton's visit to Damascus, or as results of that journey, in October 1873. A long letter from Leighton to his father describes his impressions of Damascus and gives some account of his work there (Life II, 206-9). Barrington, Mrs. Russell, The Life, Letters and Works of Frederic Leighton. 2 vols. London: 1906. Newall, Christopher. A Celebration of British and European Painting of the 19th and 20th Centuries. London: Peter Nahum, nd [1999? ].